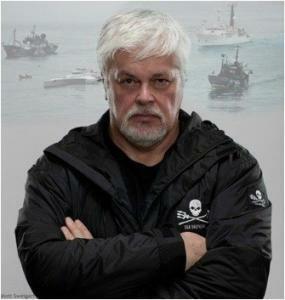 We initiated the most effective marine anti-poaching campaign in history and it was successful because the Sea Shepherd Conservation Society not only initiated it, we pursued it and did not give up until the entire criminal operation was shut down. What is the point of international conservation law when governments simply fail to enforce the laws? These six unregistered and non-licensed ships plundered the Southern Ocean, stealing tens of millions of dollars/euros of Antarctic toothfish (marketed as Chilean Sea Bass). Each ship has borne multiple names but we tagged each one with just one of their bogus names and in December 2014, two Sea Shepherd ships, the SAM SIMON and the BOB BARKER set out from Australia and New Zealand to hunt down the THUNDER, PERLON, SONGHUA, YONG DING, KUNLUN and VIKING. The first to be found was the THUNDER by the BOB BARKER. The THUNDER was the most notorious of the six. They dropped their net and ran with the BOB BARKER in full pursuit, a pursuit that would last for 110 days, the longest high seas pursuit of a poacher in Maritime history. With the BOB BARKER in continuous pursuit of the THUNDER from the coast of Antarctica northward into the Indian Ocean, the SAM SIMON with the confiscated nets stowed, turned, tracked and found the KUNLUN, YONG DING and PERON. When the New Zealand Navy arrived, the SAM SIMON thinking the three poachers were now in the hands of the law, broke off to follow and assist the BOB BARKER in a chase that rounded the Cape of Good Hope and up the West coast of Africa as far as the Equator. Captain Peter Hammarstedt on the BOB BARKER and Captain Sid Chakravarty on the SAM SIMON and their two crews of international volunteers were relentless. The THUNDER could not sneak into any port with their illegal cargo as long as Sea Shepherd stayed hot on their stern and the BOB BARKER was like a shadow the THUNDER could not shake off. As the chase carried on, the SAM SIMON delivered the evidence to Mauritius, and Interpol flew in to inspect the seized net and to initiate an official investigation. As the SAM SIMON departed to continue to catch up with the BOB BARKER they learned that the New Zealand Navy had failed to board the KUNLUN, SONGHUA and YONG DING and had allowed them to escape. Australia has also intercepted the KUNLUN and permitted it to escape. A few weeks later the SAM SIMON caught up with the BOB BARKER and the THUNDER in the waters off Sao Tome Principe and with both ships on their tail the captain of the poaching vessel decided to end the chase by scuttling his own ship in full view of the BOB BARKER and SAM SIMON. He did it in an attempt to destroy the evidence of his illegal activity but three BOBBARKER crew boarded the sinking vessel and secured the evidence as the crew of the SAM SIMON rescued the 42 poachers that had abandoned ship. The THUNDER crew were handed off to the authorities in Sao Tome Principe and both the SAM SIMON and the BOB BARKER set a course north, to Bremen, Germany where the 70 tons of gill net was offloaded and sent off to be recycled into running shoes. Back in the Indian Ocean the KUNUN arrived in Thailand where it was detained for only a few months before being allowed to escape with it’s illicit cargo intact leaving a few Customs officials a bit richer than when it arrived. The same story held for the VIKING in Malaysia. Detained and allowed to depart despite all six of the poaching vessels having Interpol Purple Notices issued against them. The PERLON however was detained in Malaysia despite the escape of the VIKING. However the chase was not up and the game was not over. The YONG DING and the SONGHUA slipped into Cape Verde and unluckily for them Captain Peter Hammarstedt had just landed in Cape Verde to insect the Sea Shepherd vessel JAIRO MORA SANDOVAL and as he was driving from the airport to meet with the crew, he immediately recognized two of the ships that had eluded the New Zealand Navy. He notified Interpol and the Cape Verde authorities detained both ships. The end of the year saw the THUNDER on the bottom of the ocean and the PERLON, YONG DING and SONGUA detained leaving the KUNLUN and VIKING at large. But not for long, Sea Shepherd mounted Operation Icefish Two and sent the STEVE IRWIN into the Southern Ocean under the command of Captain Sid Chakravarty. The hunt was on and so was the heat. The KUNLUN attempted to offload its contraband cargo in Senegal and was arrested. In November based on the evidence seized by Sea Shepherd, the Captain and two officers from the THUNDER were found guilty of sinking their ship in Sao Tome Principe waters and found guilty of falsifying papers. They were fined 15 million Euros or three years for the Captain and two years each for the officers. The elusive owners of the poaching ship did not fork over the fine so all three are serving time in a Sao Tome Principe jail. Finally in early March the STEVE IRWIN reported to Indonesian authorities that they had found and tracked the VIKING into Indonesian waters. Captain Chakravarty notified the Indonesian government and the VIKING was quickly intercepted by the Indonesian Navy. There would be no bribes in exchange for freedom. Indonesia acts swiftly and decisively when it comes to unregistered illegal poaching ships. The VIKING is scheduled to be sunk by the Indonesian Navy on March 14th and Sea Shepherd officers have been invited to film the destruction of one of the vessels we have pursued for over a year. The Bandit Six, one sunk and another about to be sunk and four arrested. U.S. Secretary of State John Kerry cited Sea Shepherd for this achievement. Interpol has acknowledged publicly that the Sea Shepherd was the primary player in stopping the notorious toothfish poachers. And this week the final blow came down with the arrest by the Spanish police of six people in Galicia, Spain, five of whom are members of the Vidal family, the owners of Ribeiro Vidal Armadores. They all stand accused of illegal fishing of toothfish in the Southern waters and these are the people that Sea Shepherd has been pointing our finger at from the beginning. The raid on the Ribeiro Vidal Armadores company was carried out by the Spanish Civil Guard, Interpol and Europol and reflects the seriousness of the charges against them. These people are facing very high fines and prison sentences and they will appear before the Spanish High Court to answer to the charges against them. In 2015 Spain’s agriculture ministry imposed fines of over €17m on three vessels owned by the Galician-based company, the very same three vessels Sea Shepherd pursued into the Southern Ocean and Sea Shepherd has provided providing evidence against them. When Sea Shepherd first initiated this program it was met with strong criticism from Australian politicians and from various large “green” NGO’s around the world. We were told we were foolish, that we could not even find them, (we did within 8 days), and if we did find them we had no authority to act. We were told that if we attempted to confiscate nets we could be charged with theft or amusingly of illegal fishing. What we did was thought to be quite impossible but our courageous and passionate volunteer crews made it possible. We shut down the entire outlaw fleet in the Southern Ocean and we did it without causing a single injury or breaking a single law. The toothfish poachers have been driven from Antarctic waters but other poachers remain. The Steve Irwin is returning this week on another hunt and for as long as any poaching vessels return to the Southern Ocean, Sea Shepherd will send a ship or ships to uphold international conservation law. These remote and hostile waters belong to the whales, the fish and the penguins and we intend to keep it that way.